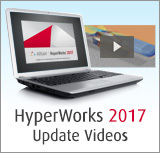 One of the most often requested advanced topics in HyperWorks is the scripting layer incorporated in the HyperWorks Suite. This class has been developed for someone new to TCL but familiar with programming. The class is fast paced, hands-on, and focused on the basic tools to get you up and coding quickly. Note: Online sessions meet 1-4pm for 2 days.